Some weeks ago I put together the reading assignments for my property history seminar for the fall. I take a lot of factors into consideration in selecting texts: what books will teach well is of primary importance; of course I'm also interested in what's new. I also look for classic literature, which my students need to read. And I always take my students' pocketbook into consideration in picking books. I know on the University of Alabama campus, the faculty and administration (as well as the students) are making a push to make sure that we consider the cost of textbooks for our students. It's the same at many--probably most--other schools. Faculty and administration are frightened by about rising costs, just as students are. The prices of the books I usually use have gone up. (I haven't taught this particular course in a while.) 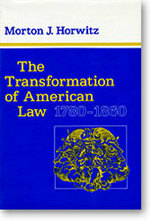 One of my favorite books of all time--Morton J. Horwitz' Transformation of American Law, 1780-1860--is now $30 new. Back in the fall of 1988 when I bought it for Eben Moglen's legal history class I paid $10.95. (This I know because I just checked the copy on my self and it has a sticker for $10.95.) That's do-able, but remember this is a seminar and I'd like to assign a half-dozen books. I'll still use Horwitz, of course--it's a great, great book. How could you teach legal history with out? Impossible, IMHO. Thankfully, there are tons of used copies available on the internet, cheap. So I sent an email to all my students telling them to check out their favorite internet used book dealer--half.com or amazon or whatever--and get Horwitz now, so that they'll have it in time for the fall. 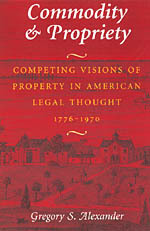 And, btw, if you're a propertyprof and haven't read Horwitz' Transformation, I recommend it--particularly the chapter on property law. Quite frankly, however, the economics of this caused me to re-think a couple of other assignments. I looked around for some books that are priced for adoption. 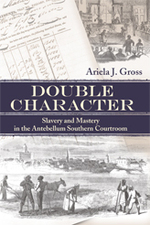 This year, I'm branching out to the University of Georgia Press (for Ariela Gross' stunning Double Character, which was expensive when it came out in hardback from Princeton but is now priced at about $20) and the University of Kansas Press (for Forrest McDonald's Novus Ordo Seclorum, which is thankfully priced at $14.95 new, but with used copies less than $5). Both the University of Georgia and University of Kansas price books for adoption. That's very important and I think will become more so, as universities feel pressure to save money everywhere. All of this caused me to think about advice that I commonly give regarding shopping a manuscript to book publishers. There are a lot of things to think about as a book author. Of course, prestige of the press is a critical one. Brian Leiter puts six presses in the elite group for law monographs (in alphabetical order): Cambridge, Chicago, Harvard, Oxford, Princeton, and Yale (with honorable mention to California). I don't see the hierarchy exactly the same way as Leiter, but his advice on rankings is always very, very sound. There are a lot of other things to think about, like how committed is the press to the book? Will they get it out fast, or will it be in development for years? And don't underestimate this: when we you're shopping a manuscript, if you're interested in getting adoptions, it's important to be sensitive to what presses typically charge for books. I certainly understand that some books are not written for a student audience. For those, the pricing policy does not matter much, I suppose. But if the price is right, I think there are a lot of even pretty sophisticated books that will reach a student audience. I almost always assign a monograph to my property students and often assign one to my wills and estates and my remedies classes. They're capable of handling pretty sophisticated works. And one of the things we want to do is push them, too, to be better readers. Another factor besides price that is critical in adoptions is: how long a press keeps its work in print. I wanted to assign Don Fehrenbacher's Constitutions and Constitutionalism in the Slaveholding South, which was put out in a nice and very affordable paperback edition some years ago by LSU (along with some of Fehrenbacher's other work). Alas, it's out of print. Maybe later this summer or early fall I'll post a little bit on what I've learned about book publishing from serving as books reviews editor at Law and History Review. I work for one of the publishers you mention. It's true, as you imply, the publisher's perceived audience for the book effects the printrun and so effects the price. Another important factor is length. A 500 page book is of course going to cost more to produce than a 200 page book. Comparing price per page rather than price per book might be a more accurate measure.